A year ago Delta was planning on retiring their 747 aircraft. I made an attempt to get a seat on the last scheduled 747 flight. That didn't work out but luck turned it into a flight on their new A350. The whole story is coming soon in the Delta flight. However that was getting back from Asia. Of course I had to get to Asia first. Did you expect there not to be any drama with that? I'd hate to disappoint. The destination was Bali because the Delta trip had a leg with Garuda Indonesia which was a bucket list airline. Given many months to book tickets only to have schedule changes, in the end I wound up on this Japan Airlines flight. The original choice used UA points. It was a new technology series of flights; Air Canada 787 to Frankfurt, Thai Airlines A350 to Bangkok and then TG B787 to Bali. I ticketed this back in February. 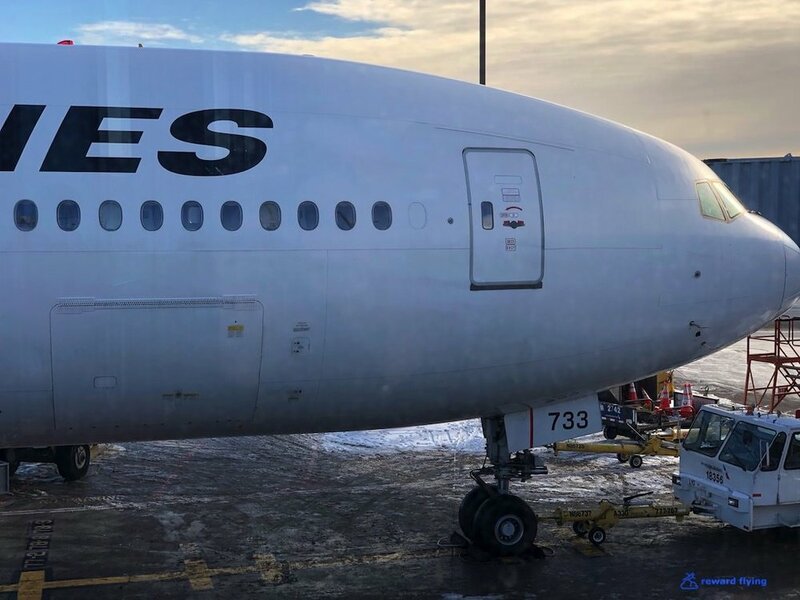 Then sometime in June Air Canada changed their schedule and moved the 9:40PM departure to 6:30PM creating a dreaded 14 hour layover in Frankfurt as well as moving the positioning flight from ORD up to 10AM, a 5 hour layover in YYZ. Also the 787 got swapped for a 777. Later in August I flew the TG A350 and wasn't enamoured with that experience. A final nail was typical Thai as they swapped the 787 to Bali for a 777. The appeal was long gone so I canceled it at no cost, which you can when a schedule change, not aircraft change, like this happens. Next I booked Qatar Airways. At the time this route had the potential to be on the new Q-Suites as the rumor was JFK was getting them albeit on the 777 and I was on an A350. But I had a plan to fly standby for the 777, not knowing if would work. The drawback was this route was 2 reward tickets because American AAvantage won't allow Asia travel across the Atlantic, which is silly. But it's their program and not mine. So it was expensive, over 100,000 points but promised to be a good trip on Qatar A350 and B787. There was also the possibility of taking Hainan Airlines to PEK and Singapore Airlines to Bali. I had that on hold as well but decided against it. I even considered Air China in first class instead of Hainan. Then one day searching on KVS Tool I saw a business class ticket with AA points from Chicago to Singapore via Tokyo on Japan Airlines. Qatar had a schedule change that allowed cancellation at no cost so I dumped that and held the JAL award. But after I hit the hold button it dawned on me, the ticket would have been significantly less expensive using Alaska points, like 15,000 less. What did I do! So the question became, if I released the reward hold would it return to inventory so I could book it with Alaska points? I gambled it would. I lost. It didn't. Now I had nothing. A few days or maybe a week later, as now I was checking daily, out of the blue Japan Airlines appeared again, only not a business class reward but a first class reward! The extent of First Class services on JAL at Chicago's O'hare. No red first class carry-on bag tag. No map to the lounge. They don't even have TSA Pre. Not even a boarding pass jacket. I was granted access to American's Flagship lounge. You can read about that visit here. In the driver's seat is Captain T. Ueno. When I had placed on hold the JAL flight in business with American they reserved some seats for me as well. The primo seats are 5A and 5K, window seats in the one row business class mini-cabin between first class and door two. If I have a single complaint with JAL it's that they block a significant number of seats for pre-assignment. These two windows seats fall into their blocking craze. But I'd read somewhere that 5E was the most private on the plane. While having no window, which is typically a prerequisite for me, this seat did seem rather intriguing. So I reserved 5E. Entering through door 2 gave me an opportunity to view this seat for future reference. There's no question, it's private, even with privacy partitions down. I've read a lot of flyers love the Apex seat. In my opinion is it's a good seat, just too narrow. If the opportunity would present itself, 5A or 5K would be my choice. Whether I could get one is another matter. But this mini-cabin has to be one of the best on any 777. Today's attendance in first class would be five. Four people in row two and me in row one. JAL remains as one of my favorite first class cabins. Each seat had the JAL amenities placed in succession, slippers, kit, headphones and Shiseido skin care products. Earlier this year JAL offered a Porsche Design sleepsuit which was incredible quality, to the point you could wear it going out. Today's flight was back to the standard JAL offering which I found to be excellent as well, although not quite as good as the Porsche suit. Nevertheless when landing in Tokyo I didn't even bother changing out of the top and could have easily kept the pants on as well. A beautiful view of Chicago on a VERY cold winter day. But for those that have flown out of Denver this might look familiar where the city's flat lands edge against the snow capped mountains, or in this case the clouds over Lake Michigan. The last time for Salon on JAL as they are switching to Cristal by the time this is written. Hardly a downgrade but still less expensive. As you can see once past Appleton service commenced. Unfortunately this would be my only glass as only one bottle of Salon was boarded and apparently it was very popular in row two. The Amuse Bouche as explained in the menu was a smoked sea scallop and portobello mushroom along with marinated king crab with yuzu chili and turnip veloute. What I tasted was more like a mushroom with cream cheese and ham with citrus fruit. And I didn't care for either of them, whatever they were. But no worry as a JAL favorite was to follow. It was served with an egg yolk mascarpone cream cheese which was quite good, and different as well. However I'm not sure what the smoked sturgeon did for this dish. Since there was no more Salon, it was back to my old standby. This version of my old standby was a useful Bordeaux and especially nice for the reasonable price of $35USD. Today's first class cabin was attended to by 3 very nice Japanese women, Yamamuchi, Urano and Sakaguchi as well as the Senior cabin attendant M. Wantanabe. All were extremely nice, friendly along with holding a constant smile. Yamamuchi placed the bottle on the tray for a more formal picture. Heading up to the flight I was leaning towards trying the western option hoping for a Wagyu steak. Not today. Probably that is served out of Japan only. But with multiple successes from the Japan side of the menu there was little hesitation. Kozara was first. This is always my favorite when flying JAL as it has yet to disappoint. Clockwise from the top left, Carrot and Abalone. I wouldn't say any were to die for, but the carrot and abalone was probably the most memorable for me. Next was Owan, a clear broth soup with a chicken meatball. It was pretty bland. Following soup was the serving of Mukozuke and Azukebach together. The Mukozuke was uninspiring, on all counts. Nor did I care for the Azukebachi of Egg Tofu and Salmon Roe. Maybe it was because this would be the third serving of fish eggs. One can't argue with it's presentation. So far we aren't doing too well. The Dainomono main course was next. It was served with either rice or chirashi which was a combination of sushi and rice. The best way to explain the beef in this dish would be plain boiled beef, which isn't very good. It's why beef is served with sauces or grilled to caramelize the surface, hey even ketchup or mustard. This simply tasted like plain boiled beef, and not a prime cut either. It was well done too. However the chirazi was excellent. And finally the Japanese pickles, I'll spare you the miso soup. I finished off the rather disappointing meal with Kanmi, or dessert. I have no idea of what it was. But I was instructed to sprinkle the salt on top. JAL does serve some good coffee on board. Needless to say, it wasn't long before the menu was opened again. I selected the rice bowl with fermented soybeans. After a few minute Urano, who spoke excellent English returned to make sure I knew what fermented soybeans were. Actually I like natto. She was surprised. The seafood was tuna and the dish was fresh and tasty, just be careful of that dab of wasabi! On a couple other JAL flights I've found the mid flight sandwich to be very tasty. So I tried the ham and cheese. Today it was mostly bread. Arrival meant one last chance for a culinary delight on this JAL flight. So I switched cuisines and went Western. Oh if I could only learn how to make that baked tomato with cheese! It was better than good. Lastly the Panna Cotta was strawberry in flavor. The arrival meal was the best offering on this flight. Too bad it was so small. Along the way I enjoyed some of this JAL exclusive, Royal Blue Tea. It is delicious. The balance of the Wine List as well as other beverages available. Other amenities on this flight included the amenity kit as well as headphones and Shiseido skin care products. Japan Airlines offers free Wi-Fi for first class passengers upto 24 hours on the same flight. It worked well with the exception when flying in the northern regions of Alaska as forewarned. 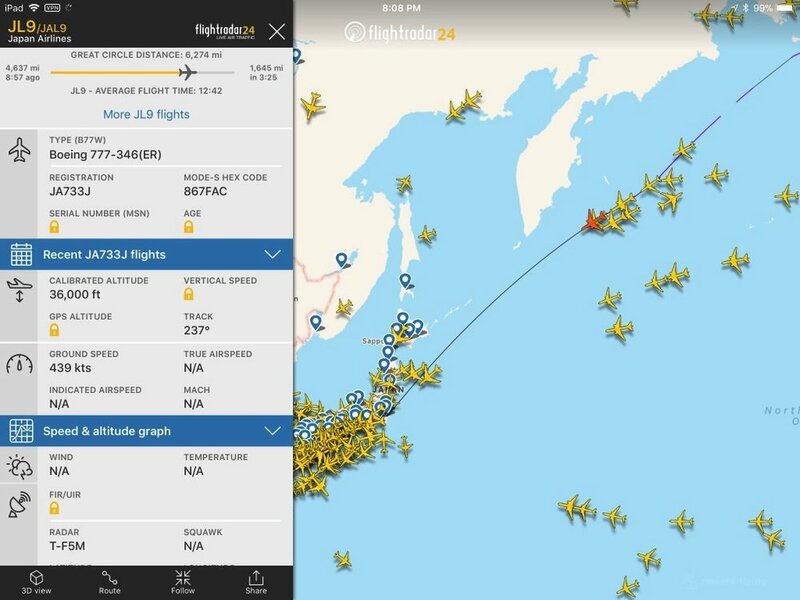 Leading the pack to NRT. At the door one entrance JAL has this self-serve bar. The mid-flight presentation offered a small selection of items which became even smaller once the photo was taken. 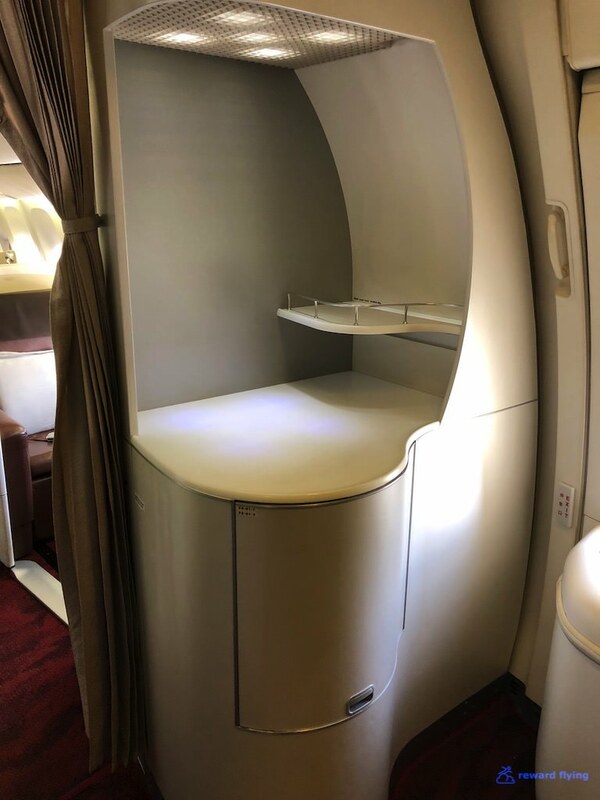 The lavatory on this Boeing 777 was a little larger than standard size and stocked with toothbrush and mouthwash. Before arrival one last look at the JAL first class seat, 1K. Here is a proper two person dining experience AA. Across the aisle is 1G that remained unoccupied, for now. A full season one of House of Cards was consumed on this flight. With an occasional glimpse of the airshow. When it was time to sleep Urano offered 1G for the bed. The airweave mattress is very comfortable but sleep was not on the agenda for me. I find it difficult to sleep going west during the body clock's daytime hours. The JAL first class seat has plenty of storage. 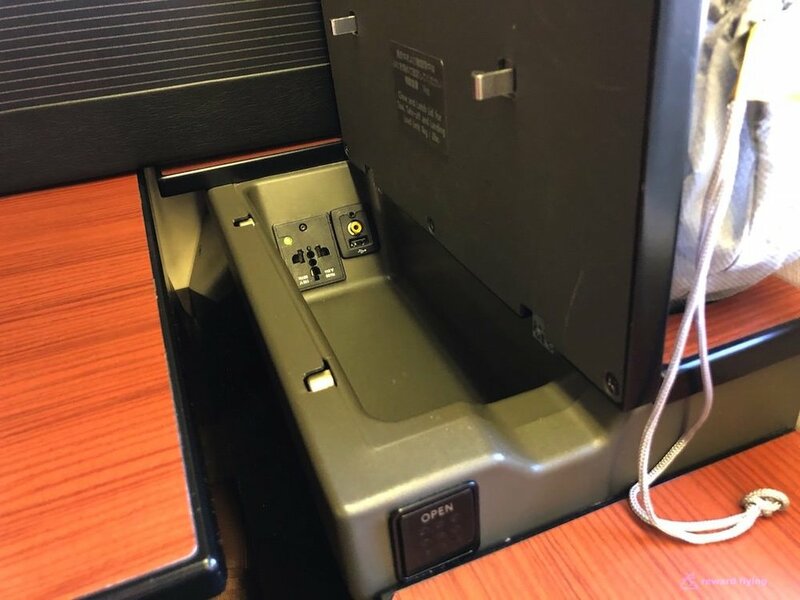 Would like to see the USB port closer to the seat itself. And dual reading lights with a built in headphone hook. Oh Canada, does it look cold down there. On approach, no it's not LAX. 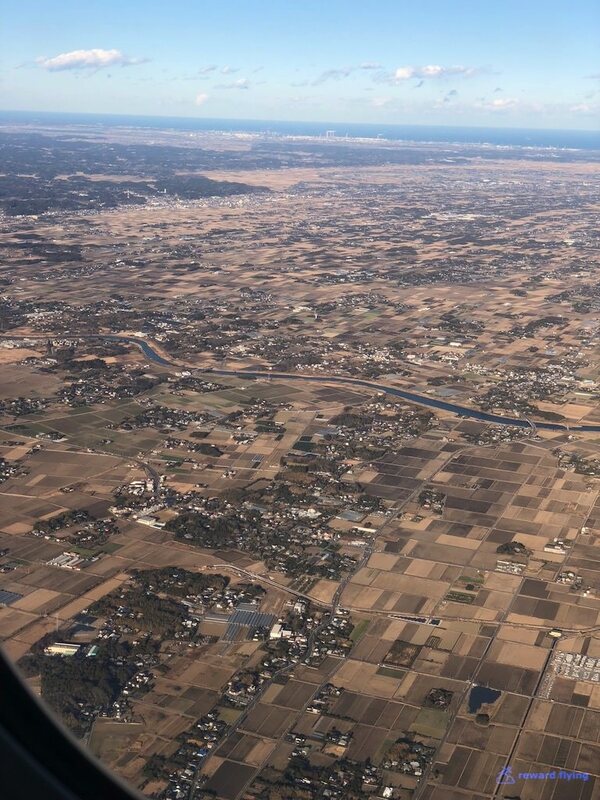 Landing at Narita, too bad just a transit as it looks like a beautiful winter day in Japan. Reassurances for a proper landing. This was a 2 leg trip; first class from Chicago to Narita and business class Narita to Singapore. Almost all programs would price this reward over 100,000 points. For example American would charge 110,000 points. But Alaska is one of the few bargain basement redemptions left, 75,000 points and about $35.00 in fees. Get it while you can. ✔︎With only 8 seats in first class this is an exclusive first class cabin. ✔︎One of my favorite first class seats and bed. The JAL airweave mattress and bedding is outstanding. ✔︎Excellent quality amenities including very comfortable and anytime wearable pajamas. ✔︎Japanese style meals are always a pleasure to view. ✔︎This flight didn't live up to my expectations, the question is was it my expectations or the food itself? ✔︎Great monitor and enough content to keep me happy for 12 hours. ✔︎All flight attendants were great. It just seems instead of them checking on you, you needed to ring the bell. Which I prefer. ✔︎B777-300 Standard long haul aircraft. What's not to like? Tell us about your Japan Airlines experiences. Feel free to leave a comment below.